As semi-hollow electrics go, this is perhaps my favorite, a Collings I-35 Deluxe, this one built in 2017. You will see these on my website often, because I love them and I sell what I would want to own myself. The I-35 Deluxe is the top of the model line and has a solid (not laminated) carved top and with purfling. This one has a premium quilted Maple top and is finished in "Tiger Eye" nitro lacquer. The neck is Collings medium/fat C-shape, measuring .875" at the first fret, increasing to .985" at the twelfth fret. The fretboard is made of Indian Rosewood, with parallelogram inlays and ivoroid binding. The bone nut has a width of 1-11/16", the fretboard radius is 12" and the guitar weighs just 7 pounds, 1 ounce. The electronics include Lollar Low Wind Imperial humbuckers with a traditional 50's style wiring setup (2 vol/2 tone/3 way). The bridge and tailpiece are nickel-plated Klusons. I've repeated these superlatives frequently, but please bear with me.The build quality, playability and tone of this guitar is superb. Despite all the alternatives, including several costing thousands of dollars more, this model is my personal preference when looking for a 335-style guitar. It feels like it was carved from a single piece of wood. It plays so much better than the guitar is was modeled after and sounds better too. Please check out the brief sound sample provided. This fabulous instrument is in excellent minus condition, with only a tiny impression the back of the neck in the area of the fourth fret which you don't feel during play and a hard to see nick on the tip of the headstock, both of which are pictured. Otherwise, this is like a new guitar and the frets are flawless. Included is the original Collings/Ameritage case, paperwork and cleaning cloth. A new example of this guitar will cost you well over $6K. This lovely 2017 example can be yours for a bunch less. Press the 'Buy Now' button and make this beautiful Collings yours! 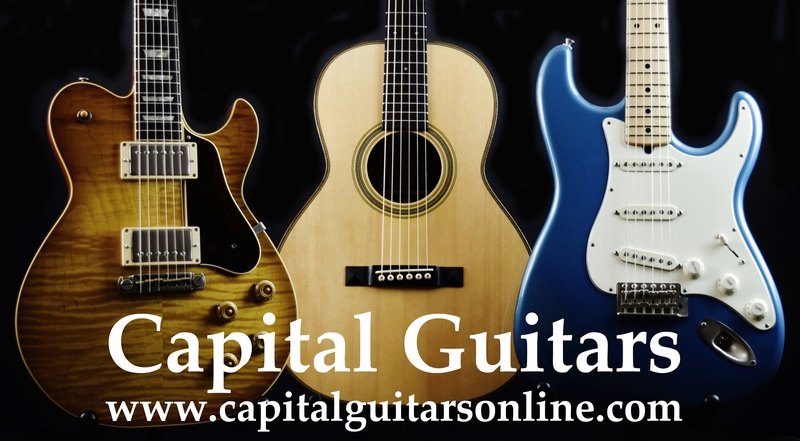 Capital Guitars accepts payment via PayPal, credit cars via PayPal, wire transfer, or via bank check. Guitars ship only after payment clears. See something you wish to purchase? To pay via Paypal, just click the 'Buy Now' button, or send an email to capitalguitars@gmail.com indicating the guitar you wish to purchase, where you live (for calculating the shipping cost and NYS sales tax if applicable) and confirm the email address you use for Paypal. We will send you a Paypal invoice referencing the specific guitar being purchased. Just follow the prompts in the Paypal email to pay for your guitar. Once we receive your cleared payment we will contact you with tracking information and a paid invoice. That is all there is to it! Shipments to locations within the State of New York are subject to imposition of applicable New York Sales taxes. Trade proposals involving quality gear are welcomed! Email me a pic or two of your proposed trade and a brief description of its condition and we will let you know what we can allow you in trade. We also do LAYAWAYS! All layaways require a non-refundable up-front payment equal to 20% of the purchase price. Your deposit holds the guitar for you, with 60 days to pay the balance. Contact us via email for more details. Shipping to Continental US addresses is via FedEx Ground, with flat rate shipping of $60 to Eastern time zones, $70 Central and $80 Mountain/Pacific. Shipping to Alaska and Hawaii is $100. A phone number at the shipping destination is required. ​ Other shipping services, including express services and international shipping are available at our discretion, just contact us for a quote. Refunds of the original purchase price less shipping and a 10% restocking fee may be requested within 48 hours of delivery. Exchanges within one (1) week of the original date of purchase may be made for an item of equal or greater value at the discretion of Capital Guitars. Where permitted herein, items must be promptly returned at the buyer's expense, in the same condition as received with all accessories and paperwork included. Sale items, purchases that are made via layaway, those involving trades and/or international shipping are considered final except upon an error by and at the discretion of Capital Guitars. All deposits are non-returnable. Our apologies, but we are a very small operation and returns are extremely time consuming and costly.